Dr Nick Gottardo, a paediatric brain cancer specialist and part of the Brain Cancer Discovery Collaborative, has described medulloblastoma as the “poster child of paediatric neuro-oncology”. We've been taking a closer look at this research success story. Medulloblastomas grow in the cerebellum. They are fast-growing, high-grade brain tumours which most commonly affect children, but can affect adults too. Read more about childhood brain tumours. Symptoms vary from patient to patient. As with most brain tumours, we don’t know exactly what causes medulloblastoma. For the vast majority of people with a brain tumour, no outside cause can be clearly identified, which is why research is so critical. In the case of medulloblastoma, researchers have made huge progress in understanding some of the genetic drivers of the disease and its sub-types, leading to better, tailored treatments. Medulloblastoma research is a great success story, with survival rates now 60 - 80% on average and as high to 90 - 100% for some of its forms. However, treatment is very intensive and has side effects. It involves radical surgery and radiation therapy to the whole brain and spinal column, as well as chemotherapy. A report from the Childhood Cancer Survivor Study, recently discussed at ASCO 2014, found that adult survivors of childhood medulloblastoma have a higher risk of neurologic morbidity and lower levels of educational attainment and social independence. The report says that given the high survival rates for these children, we need to find ways to reduce these consequences and better support survivors. So the challenge for researchers like Nick Gottardo is to find new and better therapies to treat medulloblastoma which have fewer side effects, leading to a better quality of life for patients. - Dr Torunn I. Yock, MD, Director of pediatric radiation oncology, Massachusetts General Hospital. In medulloblastoma, genes including Sonic Hedgehog (shh), WnT, Notch and Myc are often missing from certain cell-signalling pathways. Sometimes chromosomal abnormalities are observed, such as the loss of 17p chromosome, which is seen in around 50% of cases. The good news is that by understanding the molecular biology of the disease, scientists can begin to develop ways to correct or target mutations. For example, Brandon Wainwright, who recently attended our International Scientific Meeting, is Director of the Queensland Institute of Molecular Bioscience and discovered that the Patched gene was a controller of the Hedgehog pathway in medulloblastoma. The Hedgehog pathway is a signalling pathway found in many cells, which has three types of protein encoded by genes of the same name - Sonic Hedgehog (shh), Desert Hedgehog (dhh), and Indian Hedgehog (ihh). Sonic is the most comprehensively studied of the three. The three types regulate different parts of the body, but Sonic is observed in the developing central nervous system. The Hedgehog gene is so-called because when it was discovered in fruit flies the mutation made it look spiky under a microscope. Of the three homologues, Desert and Indian are named after species of hedgehog and Sonic is, of course, named after the video game character. Brandon Wainwright and his team, supported by our partner The John Trivett Foundation, are now looking at manipulating a number of genetic pathways they have linked to the Hedgehog signalling pathway, in order to suppress medulloblastoma tumour growth. They recently showed that blocking the Hedgehog pathway can kill brain tumour cells in an animal model of medulloblastoma. 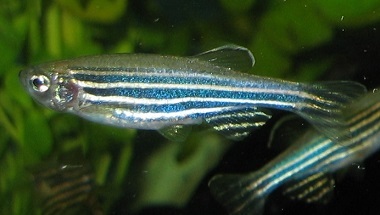 Zebrafish also have a Tiggy-winkle Hedgehog gene (twhh) and an Echidna Hedgehog gene (ehh). This is why zebrafish are used in brain cancer research. In 2013 a childhood brain tumour symposium was held in Perth called Medulloblastoma Down Under, involving leading experts in medulloblastoma, including Nick Gottardo and Brandon Wainwright. They identified next steps required in medulloblastoma research, which would enable collaborative international research and improve clinical trial design as new therapies are developed. They reached a consensus on the sub-classification of the disease and now plan to establish a central base for further clinical data. Another key action point is to utilise high-throughput drug screening to find new therapies to treat medulloblastoma, which is something Nick Gottardo is working on. The technology can rationally screen thousands of drugs in an unbiased manner for their ability to kill brain cancer cells, thus speeding up the research pathway. They identified establishing a central repository of mouse models for medulloblastoma as an important step to enable collaborative research, by making these models available to the international research community. And initiating collaborative clinical trials and improving clinical trial design was identified as another key focus for the future. As has been seen throughout cancer research, discoveries made in one area, like medulloblastoma, can often be applied to other areas - especially as our understanding of the genetics of cancer evolves beyond categorising cancers by body part, and starting to view cancers by their molecular drivers. “the more we know, the more we realize there is more to know”.